If you're considering a pet bird, doing research is highly recommended. Parrot rescues as well as adoption and education organizations can help you make the decision as to which species is a good fit for your family. These organizations are there to help you with learning about each species—teaching you and your family about proper care and what to feed your bird. They are highly skilled at matching a bird to an individual or a family and have good results that make selecting a bird easier than simply going out and blindly purchasing a bird without knowing anything about the traits of a particular species. 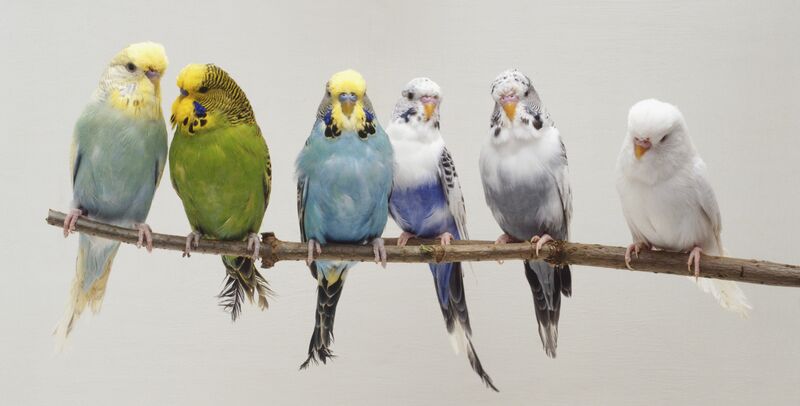 The common Parakeet, or Budgerigar, makes a wonderful pet for children or those who are new to keeping birds. While these birds are smaller than their bigger peers, they require the same respect and care. These hardy little jewels come in an array of beautiful colors and require less space and maintenance than larger bird species. They are quite intelligent in spite of their small size, and while most are content to whistle and sing, some have been known to learn words and phrases. The average life expectancy is 12 to 14 years. These medium-sized birds are simply a delight to keep. Members of the parrot family, these Australian natives are known for their surprisingly advanced whistling and singing abilities. While Cockatiels are capable of learning to talk, many owners find that their birds prefer to whistle and tend to mimic quirky, random sounds such as the ringing of a telephone. These birds are available in increasingly diverse color combinations and have an average life expectancy of between 15 and 20 years. Finches and canaries are other popular types of pet birds. With most varieties measuring 5 inches or less, Finches and Canaries require less space than most other bird species. Unlike parrots, which are hookbills, finches and canaries are known as softbills or waxbills. These little birds thrive in small flocks and generally pay little attention to humans making them perfect pets for those who love to watch birds but would like a pet that requires minimal interaction. A Finch or Canary can live for up to 10 years if it is cared for well. Lovebirds are one of the smallest known parrot species. These beautiful little birds should not be overlooked in favor of larger, more demanding parrots; any Lovebird owner will tell you that these birds possess all the intelligence and personality of the largest of macaws. These birds are fairly quiet companions, making them ideal for those who live in apartments or condominiums. At around 6 inches long, the Lovebird has a life expectancy of up to 20 years. African Greys have been said to be the most intelligent of birds, some boasting very large vocabularies. Because these birds are so smart, they tend to be demanding pets and will get bored quickly if not stimulated. If you are looking for a highly intelligent and affectionate friend, however, the African Grey may be right up your alley. Greys are amazing birds that are easily trained once you learn the training techniques of applied behavior analysis and positive reinforcement training. Harvard professor, Dr. Irene Pepperberg did extensive research in the cognitive abilities of these birds and her inroads in the field of cognitive abilities of African Grey parrots rocked the world of science. Greys typically live fairly long lives in captivity if cared for and fed properly—Dr. Pepperberg's work with her African Grey, Alex, spanned over three decades! These ever-popular birds are fun to have in your family. But (like all birds) it takes time and work to keep them occupied, cared for, and their cages cleaned/picked up. Birds can be very messy! Despite this drawback, birds in your world can be a wonderful thing.